HARLINGEN — A Harlingen man was arrested at his parent’s home recently after police said he committed a hit-and-run that left another man with serious injuries. Police said they tracked Andrew Martinez, 25, down after starting their investigation with no witnesses and no description of the car involved in the hit-and-run. According to police reports, Martinez fled from the scene where he left a man lying in a ditch early Sunday morning, Sept. 3. 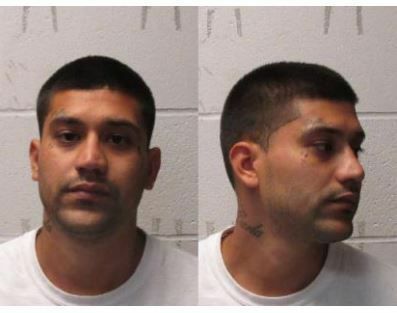 Martinez was arraigned in municipal court on Monday morning, Sept. 4. Police reports stated Martinez’s bond was set at $50,000 for an accident involving serious injury, a third-degree felony. Police Sgt. Larry Moore said the crash happened near the intersection of Queen Sago Drive and Beckham Road. Moore said the hit-and-run happened Sunday morning around 5:45 a.m.
Police said the male victim had extensive injuries and was transported to a local hospital for treatment. Moore said the victim underwent surgery, and is recovering. Police worked throughout the day looking for leads to find the driver who committed the hit-and-run. Police began their investigation with no witnesses and no description of the vehicle involved in the crash. Police said after extensive investigation, Harlingen officers were able to locate the suspect vehicle, and the driver of the vehicle.